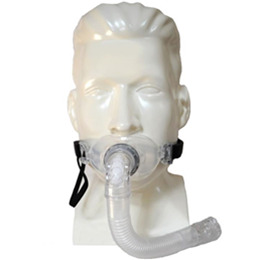 The Oracle HC452 Oral CPAP Mask is a unique mask which delivers CPAP therapy through the mouth only. It features diffused exhalation, an adjustment dial, and single strap headgear. * Bias Diffuser. The Oracle mask has an exhalation vent design of a series of small holes and uses a filter to help reduce noise. The mask comes with five filters. * Rotating Adjustment Dial. This dial adjusts the space between the SnapFlap Cover and SoftSeal mouthpiece to increase comfort and stability and can be used after the mask has been fitted into the mouth. This is an upgrade to the earlier design of the Oracle. * Single Strap Easy-Release Headgear. One strap around the back of the head keeps the Oracle stable and a swivel in the front of the mask allows free rotation of the CPAP hose. The headgear is adjusted once, then easily removed with just a pull of the Easy-Release cord. No ongoing adjustments are needed. The headgear of the Oracle is latex free, as are all other headgear by Fisher & Paykel.